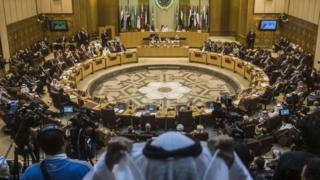 Arab League foreign ministers have condemned recent attacks on Saudi Arabia's diplomatic missions in Iran. A statement at the end of a Cairo emergency meeting to discuss escalating tensions between the two countries accused the Iranian authorities of failing to protect the Saudi embassy. It was set on fire by a crowd angry over the execution of prominent Shia cleric Nimr al-Nimr by Saudi Arabia. Most League members voted in favour of the statement. Exceptions were Lebanon, where the Iranian-backed Hezbollah is hugely influential, and Iran's ally Syria, which is currently suspended from the Arab League. No specific measures against Iran were announced; a committee is being set up to consult over possible future action. Arab League head Nabil al-Arabi accused Iran of carrying out "provocative acts" while United Arab Emirates Foreign Minister Sheikh Abdullah bin Zayed al-Nahyan accused it of intentionally inciting sectarian strife. "Iran doesn't have qualms and doesn't hesitate to use the sectarian card as a way to dominate the region and interfere in the internal affairs of Arab countries through issuing threats and support for extremist groups," he said. Iran has responded angrily to the diplomatic moves against it, insisting it had no hand in the violent protests that followed the execution. Saudi Foreign Minister Adel al-Jubeir insisted his country would continue to support efforts to achieve peace in Syria, despite rising tensions with Iran. The crisis between the Sunni Muslim kingdom of Saudi Arabia and Shia Muslim Iran began when Saudi Arabia executed Nimr al-Nimr on 2 January, causing fury among Shias throughout the Middle East. Iranian protesters - many of them students - in response stormed the Saudi embassy in Tehran. Great rivalry explained: Why don't Iran and Saudi Arabia get along? Spiralling tensions: Why crisis is "most dangerous for decades"
Sheikh Nimr al-Nimr: Who was leading Saudi Shia cleric?